My day is not complete without a crossword puzzle. It gets my brain warmed up for the day and makes me believe I won’t get Alzheimer’s. Sometimes I flip to the crossword puzzle before I even glance at the front page headlines. Yes, Egypt’s interim leader may have picked a new premier and deputy. 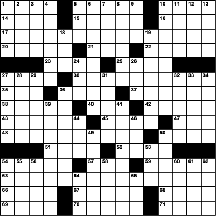 But, what is the theme of today’s crossword puzzle? I get excited on the weekends when I see the fat Sunday newspaper at the end of the driveway because I know the Washington Post magazine is rolled up inside of all that newsprint and the Sunday crossword puzzle is just waiting in their for me — all those empty little boxes waiting to be filled with words. I love the odd little clues that get my brain spinning. I love trying to figure out the quirky themes. Today, while I’m flipping to the last page of the Washington Post’s Style section to work on the crossword puzzle, I glance at my horoscope. But, isn’t pondering thinking? And isn’t the point of the horoscope to stop me from thinking so much? Maybe I shouldn’t proceed to the crossword puzzle because it requires so much thinking. Maybe I should let myself feel for a few minutes. But, I can’t ignore the puzzle because then I’ll get Alzheimer’s. To slow the brain and calm the mind. To let the wisdom in my body and soul rule and reign. What a lovely, lofty concept. I’ve read things about how our bodies store all of our experiences and how they tell the stories of our lives. Every part of us is written upon our bodies — all that we do and are is written in our bones, hearts and entire physical anatomy. That must mean there is a lot of wisdom stored in our bodies. So, if we rely too much on our ever thinking brains, we really do drown out what’s stored in our souls. I need to tap into all that stored up wisdom. My horoscope is a good reminder for me today. It comes more naturally to some than others. I’m in the “others” group — as in the group that trusts thinking more than feeling. Because of my astrological reading, today, I’m going to be cognizant of this personality trait and focus a little more on letting the wisdom of my body and soul guide me. For some people, it’s probably a good idea to engage the brain a little more; inject a little practicality and mental acuity into your life. For me, it’s the opposite. I am going to be led by my feelings today. Oh dear, the brain is protesting. C’mon. Rise up to where I can perceive you. Start sending all those sensations and emotions that are supposed to guide me today. I feel a message floating up like in the movies when the message in a bottle washes up to the shore. I’m opening the bottle; unrolling the scroll; reading the message. Enjoy the moment, they say. Write as much as you want. Forget the “to do” list. Nudge Annie out of bed and ask her what she wants to do today; then do it. She leaves for Africa in a few days, and you will miss having her home. The wisdom of my soul is guiding me. I am going to savor the time with Annie. Thank you feelings for bubbling up and clouding my brain’s thinking. I’m so glad I could feel my way to this conclusion. I did feel it, right? Or did I think it? Clearly, I need to keep working on this goal of letting the wisdom in my body and soul guide me. Now that I’ve finished the crossword puzzle, I can probably take it a little more seriously.